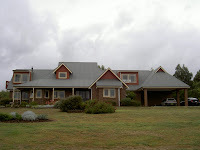 Our anniversary took us to a favourite B&B in South East Gippsland, Bayview House (left). On our last trip we’d tried places in the two nearest towns, Foster and Fish Creek. Since then, the Fishy Pub had been re-done, so we thought it would be worth checking out what it had to offer. This is a great example of a locals’ pub. The night we were there coincided with the Seachange Festival in Foster and the dining room was rammed with big family groups and noisy with cross-table conversations and exuberant chases among the kids. With no idea of the menu I had been a little worried we’d find a $30-a-main gastropub. But no, the priciest thing on this menu was the Shallow Inlet Sizzling Seafood Salad, with squid, prawns and scallops, for $32.90, which sounds worth every cent. I was really impressed with the menu. It featured lots of fish, being so close to Western Bay, and promised that all steaks were prime cuts, grain fed and aged. The pastas and risottos showed thought too, for example the Waratah Bay Risotto – sautéed scallops, king prawns, pink peppercorns, garlic, dill, seaweed in creamy white wine sauce ($21.90). Typing that out is making me wish I’d opted for that! Instead I went the butterfish special, cooked in a white wine napoli sauce, and SG chose the T-bone steak with mushroom sauce (both about $22). We showed our city bias by reading the sides – ‘served with chips and salad or vegetables’- as meaning chips guaranteed, salad or vegetables the options. Choosing the last option, we missed out on further feeding SG’s current obsession with deep fried potato. Instead we had garlic butter chaps, al dente broccoli and beans, and a field of very buttery corn each. The butterfish made me think of the white cliffs of Dover, so thick-cut and pure white was the flesh. Did I mention the portion sizes? This is a pub feeding hordes of footballers after all, and they were HUGE. Although well-textured, and with a complementing rather than dominating sauce, there was way more fish than I could do justice to. The T-bone was succulent and cooked to order. Again, the accompanying sauce added balanced flavour, indicating someone was out there stirring from scratch, not packet. Similarly, the freshness of flavour of the vegetables impressed. A range of home-cooked desserts was on offer for $7.50. The trip was worth it for the beer prices alone - $2.80 a pot – and the pub rotates a selection of local wines. Tonight was Stockyard Creek, and I went for a fine riesling. The floor staff were openly friendly and attentive, and didn’t look the least harassed by the bursting dining room, which shows they’re well-trained and that this pub is deservedly popular.